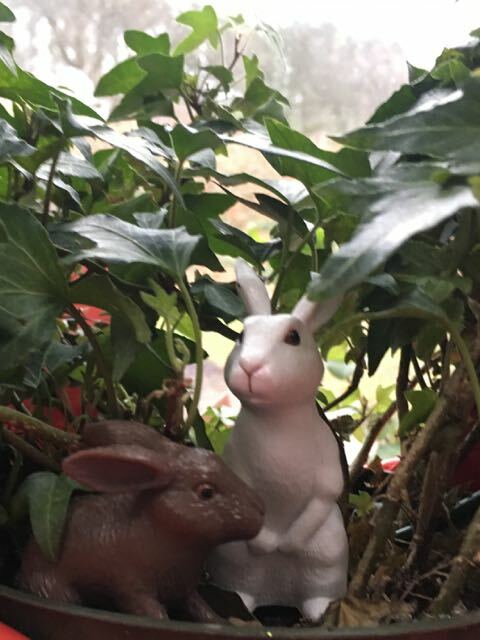 A few months ago I made an impulse buy at Target — two plastic rabbits. I set them on my bookshelf to remind me of my “rabbit” friends — an affectionate term for the people I know through The Rabbit Room and Hutchmoot (tickets go on sale today, by the way). A fellow blogger, Manee, posted pictures of her flamingo in February, calling it Flamingo February. I found myself looking forward to Fancy the Flamingo’s adventures — splashes of pink in an otherwise drab month. I also started looking around for something I could use to follow suit, and caught sight of the rabbits. I hesitated, though, because March marks the start of Lent, and that’s not a time for silliness. 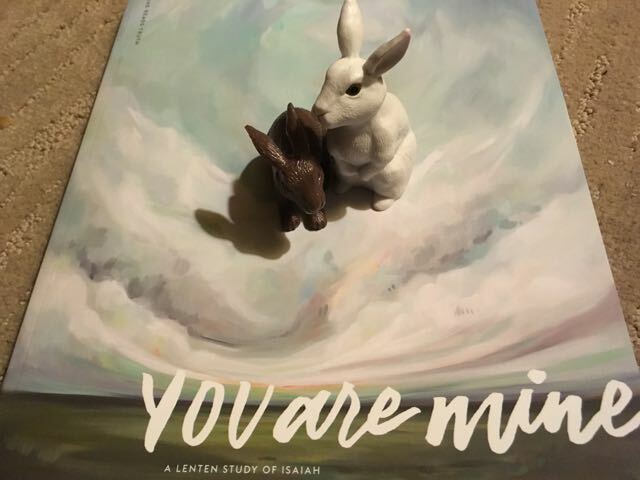 Lippity-lippity Lent sounds goofy — even though I love Beatrix Potter’s descriptive words for a rabbit’s slow hop, and I really want to slow down even more during Lent. This morning I brought the rabbits downstairs with me for my quiet time. I set them on top of my Lenten devotional. They stared at me, unblinking. “How can you help me with Lent?” I asked them. … I have called you by your name; you are mine. It reminded me of a theme that ran through Andrew Peterson’s Wingfeather Saga — the importance of names. I decided to name my rabbits Tuga and Aleluja. Tuga is the dark-colored rabbit, and Aleluja is the white one. Tuga is Croatian for sorrow. I’m going to carry Tuga with me throughout Lent. Aleluja means, as you probably guessed, Alleluia. I hid Aleluja away this morning, burying him as it were. On Easter morning, he’ll emerge again. This morning I went for a short walk with Tuga in my pocket. I patted my pants, making sure he was there. I could feel the hardness of his plastic ears poking against the denim. He will be my companion for the next 40 days. I imagine he’ll show up here a time or two. Today, especially, he’ll share my sorrow as I remember Stewart’s passing. First, thank you for the mention. Second, I adore the fact that you hide Aleluja away for Lent, lest we accidentally say the forbidden word. What a great way to remember the meaning of the season by carrying your sorrow in your pocket. I am looking forward to seeing the pictures of Tuga.